It’s not just the excess stuff that is cluttering up your day and your life. 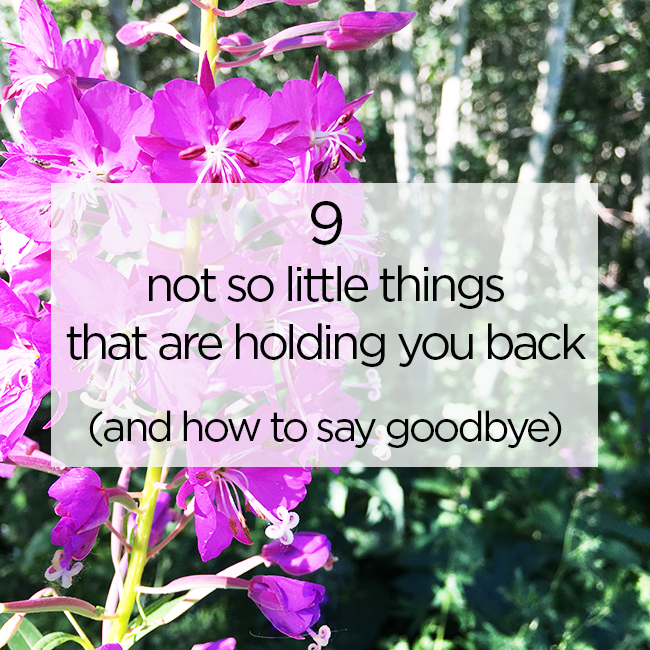 Say goodbye to any of these not so little things that may be holding you back. Then say hello to joy. Letting go can stir up guilt. You might feel guilty for letting things build up, for not paying attention to what really matters, or for overspending. It’s time to let the guilt go with the stuff. How to say goodbye: You’ve paid enough. You paid with your money, time and attention. And now you are paying with your heart and guilty feelings. You can let go now. This three-step process will help. We can be kind and loving without being sorry. Apologizing for things we don’t need to be sorry for is exhausting and often a quiet reminder that we aren’t good enough. How to say goodbye: Start here. Much of the worry, stress, overreacting, gossiping, and complaining we add to our day is unnecessary drama. How to say goodbye: Don’t engage. Simply smile and walk away. The illusion of catching up goes something like this: If I take a full day/weekend/week and abandon all the things I enjoy doing, I can get everything done that I feel guilty about not doing before. Then I will feel better, everyone will love me and all will be right with the world. The reality is that catching up never ends. There will always be more. How to say goodbye: Be present. If you are paying attention to what didn’t get done yesterday, you can’t pay attention to what’s happening right now. How can you be your most creative, most interested, and do your best work, when you have anxiety about the undone? To practice presence, set a timer for 5 minutes and agree to set your worry aside for that short amount of time while you engage in the here and now. If you are completely depleted by the end of the day, chances are your plate is too full. How to say goodbye: When your plate is full, you have three choices. When you are busy proving your love or convincing the outside world how invested you are, you compromise, push too far, and forget that when you need to prove your love, that’s not love. How to say goodbye: Show up. Be love instead of proving love. If it’s not love, walk away. Freeing up space and time in your life can feel uncomfortable. You may feel compelled to fill the emptiness of a decluttered room in your home with more stuff, or an empty calendar with appointments and commitments to avoid the discomfort. How to say goodbye: Fill your newfound time and space with things that really matter to you. If you don’t know what that is yet, fill your time and space with curiosity, self-reflection, and love. I should have more check marks on my to-do list. I didn’t do as much as everyone else. I am lazy and unaccomplished. How to say goodbye: Let’s stop measuring who we are by what we accomplish. We need to measure less by what we cross off our to-do list, and more by what’s on our heart, by how we feel, and by how we treat people. Try this free 5-day challenge to help you create space and under-schedule your life. How to say goodbye: Give yourself all the space, time and love to remember who you are. And this. The little things do count. Every tiny step does. Use the momentum, inspiration and confidence you get from taking the tiny steps to tackle the big ones. Goodbye stress, shame, and overwhelm. Hello joy. “Agree to set your worry aside for that short amount of time while you engage in the here and now”. This advice I can benefit from. I find I have small nagging worries that occupy my mind throughout the day. They tend to hold me back. Paralyze me for short periods of time. I need to control them more and benefit from less stress and more time. What you resist persists…..dont push them away, they’ll return. Look at each worry straight in the “eye” talk to it, ask if it’s true….will it happen. Once you see it, talk to it and notice it’s nothing or ego, it dissipates. JIt’s st acknowledge the thoughts, it will go…..but DO NOT KEEP PICKING IT UP. Fill that space with something to be grateful for. Drama is a big one for me. It actually makes me feel queasy. Simply smiling and walking away is good advice! Hmmmm…you hit the nail(s) on the head here. I’m sure these will inspire and touch more souls besides mine. That’s for going where few dare to go and many fear going. Keep reaching out and sparking meaning in lives. It makes a difference. Guilt, definitely…but I’m working on it. For me, it is drama. Sometimes I would want to engage and kinda get back at people. But I agree that simply walking away is the better way to deal with difficult people. Choose your battle wisely.